Jessica is always prepared, organized and in tune with the changing law. 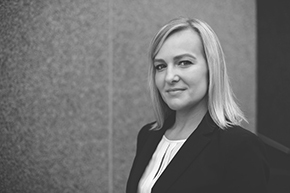 A litigation attorney by training since earning her law degree in 2004, Jessica draws upon years of experience in courtrooms, administrative hearings, depositions, settlement negotiations, and as a legal advisor to businesses in private practice and as in-house counsel at a human resources company. Her passion for the law is perhaps most apparent when fervently providing informed legal advice and proactive solutions for business clients looking to work through an issue with an employee, in reviewing a contract that may need reworking, or in handling a tenant that stopped paying rent. She also provides appropriately aggressive representation to businesses in disputes involving contracts, payment of wages, discrimination, security deposits, tenants and employment issues. Since 2012, Jessica has been assisting landlords with all aspects of landlord-tenant law. The web of laws that governs the landlord-tenant relationship can be a tangled one, particularly in the City of Madison. Landlords look to Jessica for her skill in navigating the tangled web. Jessica drafts and reviews residential and commercial leases, advises landlords on compliance and best practices, and pursues eviction actions against tenants from start to finish. Jessica also defends landlords in actions filed against them, whether it be a claim for money filed by a former tenant, a fair housing or discrimination complaint filed before the Madison Equal Opportunities Commission, a housing code violation, or a complaint before the Department of Agriculture, Trade, and Consumer Protection. Jessica particularly enjoys walking landlords through their options in how to handle delicate tenant situations and protect the landlord’s rights while complying with the laws. Jessica received her undergraduate degree from the University of Wisconsin-Madison in 2000 and her Juris Doctor from the University of Wisconsin Law School in 2004. Jessica is admitted to practice before all Wisconsin state courts, the United States District Courts for the Eastern and Western Districts of Wisconsin, and the United States Court of Appeals for the 7th Circuit. Jessica is a member of the Apartment Association of Southcentral Wisconsin, the Wisconsin Housing Alliance, and Business Networking International – Success by Referral chapter. In her free time, Jessica enjoys cooking, fitness, getting outdoors, and spending time with family. A Wisconsin native, Jessica is an avid fan of the Packers, Badgers, and Brewers.